About 3 weeks ago I published the “Consensus as a service” report. What has the fallout been over it? A few stats: in the first 5 days the PDF was downloaded 2,549 times. It has been viewed 2,414 times on Scribd over the past 19 days; similarly there were 1,217 “engagements” on the launch tweet during the same period of time. There have also been a number of threads on reddit and Twitter (there have also been a couple threads on the breakdown of BitPay’s numbers and Evolution’s numbers). As of this writing, the majority of views on /r/bitcoin and Twitter seem to take the maximalist, one-size-fits-all approach: that Bitcoin is the only way, the truth and the light. In contrast, the target audience for the report are decision makers and developers within the financial services industry. These individuals, based on months of conversations, are more interested in permissioned ledgers for their business needs because all of the parties involved in the transactions are known, have real-world reputations to maintain, have responsibilities which are expressed in a terms-of-service that is contractually binding and are ultimately legally accountable for actions (or inaction). Cryptocurrency networks like Bitcoin, a public good that purposefully lacks a terms of service or accountable validators, were specifically designed not to interface with these organizations and institutions — and intentionally created an expensive method to route around all entities (via proof-of-work). Thus in practice, it makes some sense that financial institutions may not be interested in Bitcoin as-is. This may be a problem to maximalists, who have come to create and control a narrative in which Bitcoin can and will disrupt anything and everything that deals with finance and have invested accordingly. Perhaps it will, but then again, maybe it will not. Q: Everyone talks about the enormous potential of alternative currencies and their underlying technology. But the whold world of Bitcoin and other currencies was set up to resist centralization and intermediation. It didn’t want to be part of the organized financial industry; it was openly scornful of it, and there’s still a strong libertarian, antibank strain to much of the sector today. Do you think these worlds want to be bridged? Blythe Masters: I would say that your general characterization of some in the space is correct. But if you had a really good idea about how to build a better tire for an automobile, you would probably be really interested in talking to the auto companies because they are the people that ultimately are going to make use of your technology. You could think that maybe, because of the power of your tire, there might emerge a whole new brand of auto companies that supplant the General Motors of the world because the incumbents never really got the whole concept of what a good tire should be all about. But I’m not sure that would be a good move. Why do I think this tire analogy is apt? Because each month at conferences, Bitprophets claim that financial institutions in New York, London and other global centers where capital resides, will fall to the wayside very soon. Perhaps this prophecy will come true, but it is unlikely for the reason Masters points out: most of the funded Bitcoin companies thus far seem to act like tire companies. A few entrepreneurs are hoping that newer, different car companies will not only adopt their tires but simultaneously replace older car companies that already provide the same product lines. While these startups are likely capable of providing utility and usefulness to someone, this overall narrative is probably wishful thinking. Why would Toyota or General Motors disappear and be completely replaced by new automobile companies in the coming years because someone created a new tire? Perhaps these existing car manufacturers will indeed disappear due to changes in consumer preferences or safety concerns but probably not because of a new tire. Furthermore, characterizing the 8 different projects discussed in the report as Frankenstein ledgers is funny as those writing the comments seem to have forgotten how tech iteration works. Would projects like git, which use a few of these parts, be considered “Frankenchains”? Maybe none of the projects in the report will ultimately succeed. Maybe in five or six years they fail to gain traction. Maybe future ledgers and projects add additional “moving parts” to whatever they ultimately call their chain. Yet we cannot command customer-driven technology to follow one specific narrative anymore than the previous pioneers of technology. Just ask Alfred Nobel or other inventors over the past few centuries. Furthermore, building ever larger quantities of a product without figuring out if there is a product-market fit seems to be how the Bitcoin community has attempted to operate over the past several years. Perhaps this “marketing myopia” will pay-off, maybe the Kevin Costner syndrome (build it and hope they come) will be avoided. Or maybe not. “It’s about the coin, you cannot downplay the coin!” was another common response. How do validators fit in with this again? The tl;dr of the report is that permissioned ledgers use known validators whereas permissionless ledgers intentionally use pseudonymous validators. They each have different cost structures and are targeting two different groups of customers. Why are known validators important? Because in the event a chain forks, is censored or transactions are double-spent, there is no legal way to hold pseudonymous validators accountable because there is no terms of service or contractual obligation. Or more to the point, as a public good, who is responsible for when a block reorg take place? Apparently no one is. This is problematic for financial institutions that want to be able to reliably transfer large amounts of value. If pseudonymous validating nodes and mining pools are required to doxx themselves (or the current euphemism, “trusted transparency”), they lose the advantage of being censorship resistant. Users might just as well use a permissioned ledger. In the event such a fork, censored transaction or double-spending occurs with permissioned ledgers, the validator can be held legally accountable because they are known. Proof-of-work is no longer needed and entities that are doing the validating are held accountable to specific TOS/EULA. 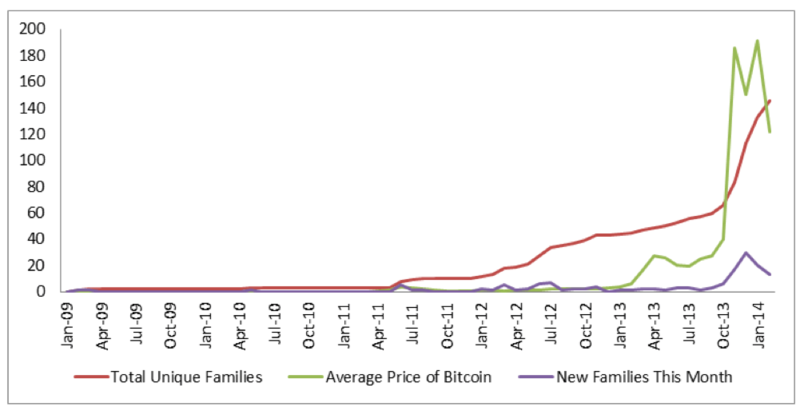 The main reason that block reorgs do not occur more frequently, like what happened in March 2013, is that it is just not worth the effort right now relative to the amount of value being transacted on the Bitcoin network. Yet if there were billions or trillions USD in financial instruments like derivatives moving across the network, there would be an more incentives to attack and reverse transactions (this is one of the problems with watermarked coins as they create a disproportional reward delta). No financial institution is going to put this type of value on a permissionless chain if they cannot claim damages in the event of censorship or reversal. “But you cannot have a secure ledger without coins,” is a common response. Isn’t owning bitcoins the most important part of this equation? Under Meher Roy’s classification chart, this is only true if hyperbitcoinization takes place, which it probably will not (recall: that which can be asserted without evidence, can be dismissed without evidence). Then why is this continually promoted? Probably because the company they work for or their personal portfolio includes bitcoins as part of their retirement plan and hope the demand for bitcoins by financial institutions and other organizations launches the price to the moon. This is not to say that Bitcoin is bad or worthless as a network (or as an asset, it may even have another black swan or two upwards), but neither the UTXO or network (as-is) is a solution to a problem most banks have. Maybe as Matt Corallo (who shared the picture above) is right: perhaps in the long-run historians will look back at these permissioned, distributed ledgers and declare them non-blockchains. Maybe they will be called something else? However, as it stands right now, even with cryptocurrencies, Bitcoin is not the only way to skin a cat. The wheels (or tires) comprising Bitcoin and its nascent ecosystem can and will be interchanged and removed due to their open source nature and differing business requirements for each organization. Keeping fees or be altruistic? Are there any recent examples of doxxing of validators? Yesterday a bitcoin user (someone who controls a privkey) made a mistake and accidentally sent 85 bitcoins to a miner in the form of a fee. At ~$228 per BTC (at the time it was sent) this amounted to a $19,380 fee. After several hours of debugging and troubleshooting, the problem was identified and fixed. Along the way, the block maker (the pool) was also identified and notified, in this case it was Bitmain (which operates AntPool) based in China who said they would return the fee. The chart above covers the time frame over the past two years, between April 2013 – April 2015. It visualizes the fees paid to miners denominated in USD. As we can see, in addition to the large fee yesterday, there are several outliers that have occurred. One that is publicly known took place on August 28, 2013 when someone sent a 200 bitcoin fee that was collected by ASICMiner. At the time the market value was $117.59 per BTC, which meant this was a $23,518 fee. It is unclear who originally sent the fee. The network was originally designed in such a way that validators (block makers) were pseudonymous and identification by outside participants was unintended and difficult to do. If users can now contact validators, known actors, why not just use a distributed ledger system that already identifies validators from the get go? What use is proof-of-work at all? Yet a trend that has actually occurred over the past four years is self-identification. For instance, I reached out to Andrew Geyl from Organ of Corti and he provided two lists. A little history: Slush began publicly operating at the end of November 2010. Eligius was announced on April 27, 2011. DeepBit publicly launched on February 26, 2011 and at one point was the most popular pool, reaching for a short period in July 2011, more than 50% of the network hashrate. Why did they begin to identify themselves and sign coinbase transactions? Geyl thinks they initially did so to help with miner book keeping and that community pressure towards transparency did not happen until later. And as shown by the roughly ~20% of unknown block creators on any given day, if a block maker wants to remain unknown, it is not hard to do so. The other question this raises is that of terms of service. As noted above, since the Bitcoin network is a public good (no one owns it) there is no terms of service or end-user license agreement. Coupled with a bearer instrument and pseudonomity it is unclear why pools should feel obligated to refund a fee; Bitmain did not steal it and in fact, did nothing wrong. The user on the other hand made a mistake with a bearer instrument. This type of altruism actually could set a nebulous precedent: once block rewards are reduced and fees begin to represent a larger percentage of miner revenue, it will no longer be an “easy” decision to “refund” the user. If Bitmain did not send a “refund” it would serve as a powerful warning to future users to try and not make mistakes. In addition, why do elements in the community think that 85 BTC is considered refundable but are unconcerned with any fee sent above 0.0001 BTC (0.0001 BTC is considered the “default” fee to miners)? This seems arbitrary. And this is a problem with public goods, there are few mechanisms besides social pressure and arbitrary decision making to ration resources. As described by David Evans, since miners are the sole labor force, they create the economic outputs (BTC) and security it is unclear why they are under any expectation to return fees. This is probably not the last time this will occur. Public goods are hard to fund as they typically fall victim to tragedy of the commons. And development, maintenance and security of Bitcoin is no exception. While past performance does not guarantee future results, IBM is once again back and has been looking into blockchain tech (through ADEPT), many of the major tech companies that arose in the ’90s (such as Amazon and Google) have payment solutions and customer usage of Bitcoin — like desktop Linux before it, despite enormous awareness and interest — still remains very niche, perhaps roughly 300,000 that actually control a privkey. Maybe this will change over time. Or maybe the buzz with this hot space will cool down in a few years and all the Young Turks will find something new to work on, leaving Bitcoin to fend for itself like Gnu Privacy Guard and many other forgotten public goods.6 Maybe they will move on to permissioned distributed ledgers which have known use-cases and customers, or maybe onto something else entirely. Over the past several months, there has been a number of useful, simplified flow charts that show the general demand and supply for bitcoins. The diagram above was created this past fall by Adam Ludwin, co-founder of Chain.com. Subsequently, there have been a variety of similar charts from others describing the flows in an easy-to-understand way. I think these are helpful and look forward to seeing more. However, based on blockchain data, what do the specific flows look like? After consulting with a number of industry experts, I constructed a rough, but more granular flow of funds based on actual user behavior. This is not to say that these trends or activities will stay the same, but rather this is a visual aid to better understanding where the supply and demand of both “coins” and fiat are within the current ecosystem. The orange buckets and arrows involve mining farms, manufacturers and pools. The brown buckets involve exchanges, ATMs, financial intermediaries, custodians and payment processors which have access to fiat (“early adopters” may also be on the sell side). The green buckets represent fiat, this can be in the form of bank accounts or in the case of Localtrader, Localbitcoins.com, #bitcoin-otc (an IRC room) and “human” ATMs actual physical cash. The champagne arrows involve the sale of BTC and block rewards. The red arrows involve the purchase and buying of BTC. The purple buckets and arrows involve illicit activity including darknet markets, scams, ransomeware, gambling, laundering and mixing of BTC. The black arrows involve the sending of BTC to another hop or address. And the blue buckets and arrows have no real commonality but are important in terms of the flow of funds. Technically wallets do not exist at all, they are just a mental analogy to abstractly describe addresses as UTXO labels (not all wallets are “burner” as that would imply an increase in anonymity and requires knowledge of intent; they all can be effectively “temporary”). In terms of mixing, certain altcoins are now a popular method for mixing. For instance, litecoin (LTC) is one of the most liquid altcoins. This typically looks like convert BTC at exchange A to LTC. Then send LTC to exchange B and convert back to BTC. Darkcoin (now called Dash) is another popular coin due to its specific “anonymity” features. See also ring signatures from Monero. If a bitcoin is eventually deemed legally property, does this new flow chart imply that the current Bitcoin blockchain is a public, near-real-time record of contraband? Maybe not. Cryptocontraband would only really apply if you indeed were able to show the provenance of the property that you are talking about.2 For many of the use cases it is actually very difficult to show the provenance of individual currency units. Perhaps this will change in the future, no one knows. What is observable? In addition to roughly 1 million bitcoins moving on a daily basis (more on that later), in the last four years we have seen several dozen high profile cases of individuals and companies whose bitcoins were lost, stolen or accidentally destroyed due to improper operational security. By one account there are more than a million bitcoins that are no longer with their legal owner.345 Consequently, in terms of venture funding, the 2nd largest vertical that has received funds over the past 18 months is hosted wallet companies (“depository institutions”) such as Xapo and Coinbase which provide cold storage (“vaults”) and some type of insurance. What has been the motivation to do so? Because in practice, bearer assets are very hard to secure hence the reason for the emergence of banking intermediaries 500 years ago and again today in the era of virtual assets. And this type of mercurial bearer ownership is not relegated to just the above-board economy. For instance, about 16 months ago Sheep Marketplace, a darknet market, was “hacked” and 96,000 bitcoins were stolen (this was worth around $40 million at the time). The purported owner of Sheep Marketplace was arrested last month. A month ago, another darknet market, Evolution, lost at least 43,000 bitcoins (~$10 million) after two of the administrators stole them. What about the “ransomware” subheading, what is “ransomware”? It is a type of software, or malware precisely, that prevents users from using their computer unless the user pays the malware creator some kind of “ransom.” In this case, bitcoins. Currently hackers are targeting smaller and more marginal actors. For instance, last month the network for Swedesboro-Woolwich School District in New Jersey was held hostage for a 500 bitcoin ransom. 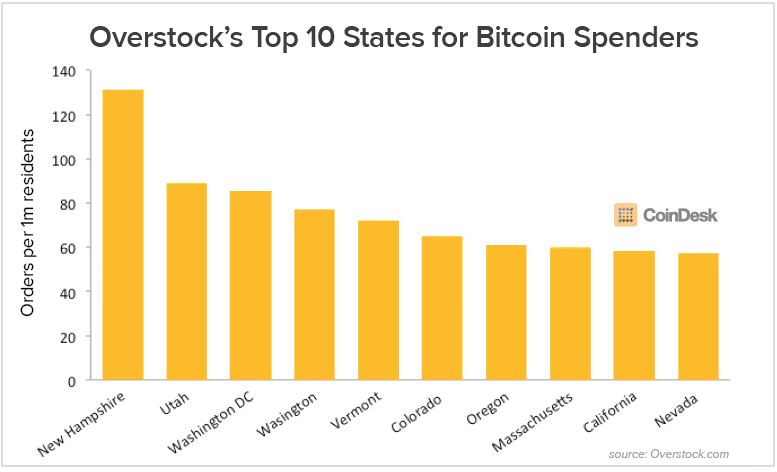 And earlier this month, the Tewksbury Police Department system in Massachusetts became just one of many public organizations that has paid similar ransoms in bitcoin. We know from public reports above of some on-chain activity, but not all. Current total output volume is around 1 million bitcoins per day. That is to say that on any given day (over the past year), approximately 1 million bitcoins have moved somewhere on the blockchain. Knowing this and taking the categorization from Slicing Data, let us make a low, conservative assumption that 80% of the remaining volume is “change” being swept into change addresses, faucet outputs (a potential candidate for “long-chains”) and mining payouts. And as established last week, we know that about $1,000,000 a day is from payment processing and above-board merchant activity, this amounts to less than 5,000 bitcoins per day. Where is the rest of the volume coming from? For instance, has the volume of Counterparty transactions increased? As illustrated in the chart above, transaction volume for Counterparty has stayed roughly the same over the past 9 months or so. A typical transaction requires about 0.0001 BTC (as a watermark) and about 0.0001 fee to miners. Thus on any given day the total amount of bitcoins used by Counterparty is a handful, maybe even just 3 or 4 bitcoins. 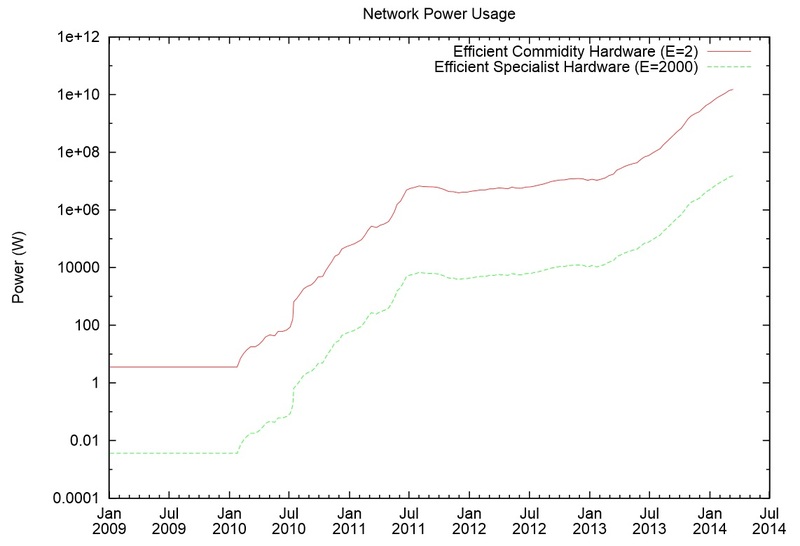 As of this writing, about 8.63% of all bitcoins are stored using P2SH. 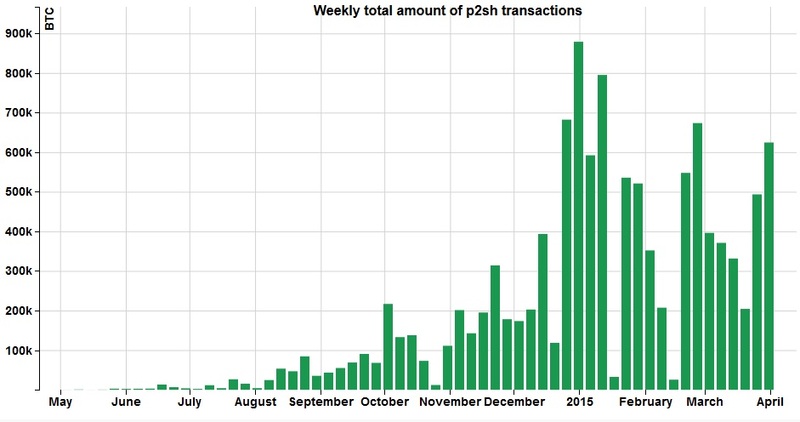 And while the last several months have each seen more than 1 million bitcoins move into P2SH, this still does not tell the whole story because that is per month and not per day, which we are observing (e.g., roughly 100,000 or so bitcoins per day move into P2SH). What else comprises this gap? If actual transactions represent 20% of the total output volume, or 200,000 bitcoins, what else could fit the bill? Payment processors collectively would account for 2.5%, P2SH would account for 50% (although technically P2SH is not commercial activity), Counterparty less than 1%, gift cards less than 1%. What about crowdsales? The largest one right occurring right now is Factom. Over the past three weeks approximately 2,180 transactions containing 1,955 bitcoins have been sent to the fundraising address; or about 104 transactions per day. Now lets assume the international payments and remittance market is at least the same size as the merchant economy (it may be lower, based on anecdotally having talked to about 10 different exchanges overseas the past couple of months); so that is about another 5,000 bitcoins per day or 2.5%. That means that we are still missing around 80,000 bitcoins per day if not more. And based on address clusters at WalletExplorer, a large portion appears to come from movement in between exchanges and hosted wallets, as well as gambling services and darknet markets. Recall that at its height in the spring and summer of 2012, nearly half of all transaction volume on the Bitcoin network were related to SatoshiDice.7 Once it blocked US-based IP addresses, its popularity waned. 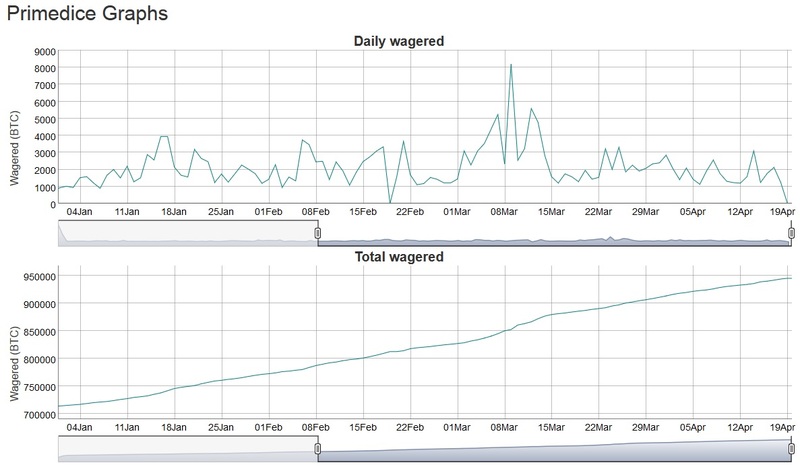 Over the past two years, since May 13, 2013, there have been 946,261 bitcoins worth of wagers at Primedice, or roughly 1,350 bitcoins per day. 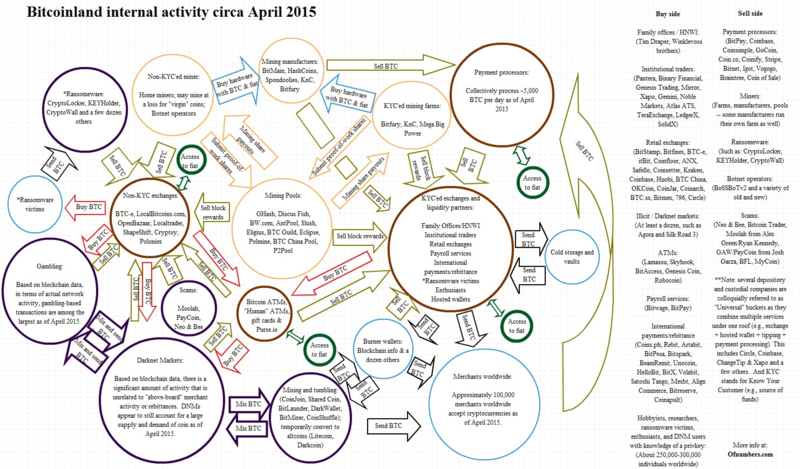 The chart above visualizes the activity on Primedice since January 1, 2015 – April 18, 2015. Based on this cluser, there is is roughly as much transactional volume passing through Primedice as BitPay does each day. For perspective, prior to emptying its wallet (the first time), on its then-summer 2012 height, Silk Road’s public address contained 5% of all mined bitcoins at that point.8 In early November 2014, Operation Onymous — an international law enforcement action targeting darknet markets, closed down 414 sites. Left unaffected were several of the larger DNMs, including Agora, Evolution and Andromeda, each of which actively sell illicit wares denominated in bitcoin. Evolution, as noted above, suffered a large theft which will be looked at below. 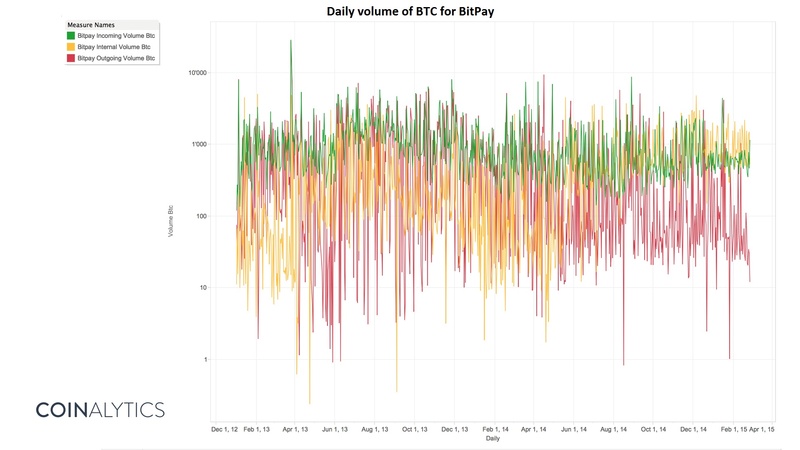 Last week we looked at some charts from Coinalytics in relation to BitPay. Coinalytics specializes in building data intelligence tools to analyze activities on the blockchain. Using labels from WalletExplorer.com (which identifies reused addresses of a number of different services), the team was able to create visual aides covering Evolution. 2) we cannot have 100% confidence on the data since it may be missing some address clusters. 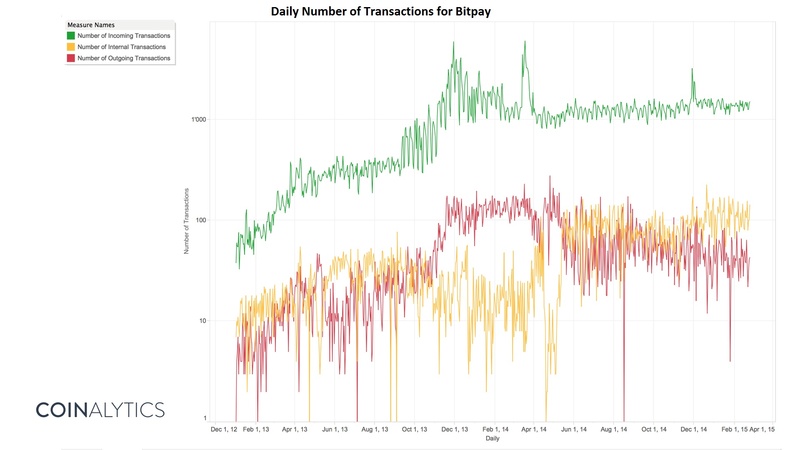 For instance, last week, the 500,000 BitPay transactions identified by WalletExplorer were 10% less than what BitPay officially reported during the same time frame (2014). Thus, there may be a similar margin of error for the following data. Evolution was officially launched on January 14, 2014 and its administrators pulled an “exit scam” with a large portion of the funds on March 18, 2015, effectively shutting down its operations. The chart above visualizes the time period between January 16, 2014 – March 18, 2015. 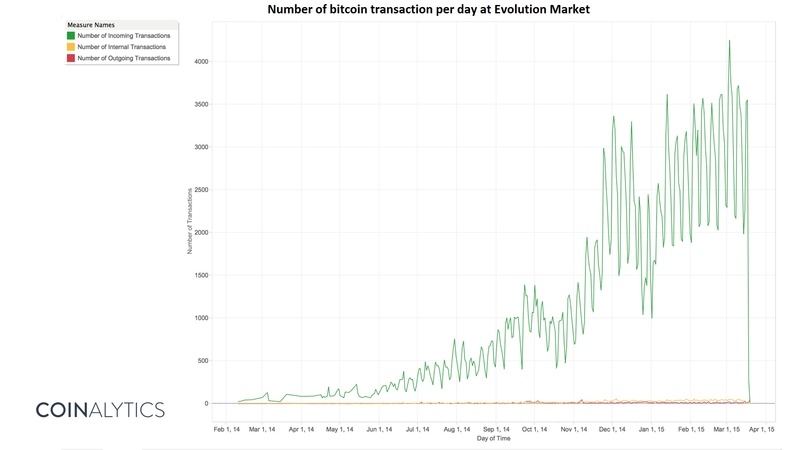 The average number of transactions per day was 1,004 and average bitcoins per day was 562. However, as shown in the chart above it was not until the fall of 2014 that Evolution hit its stride. 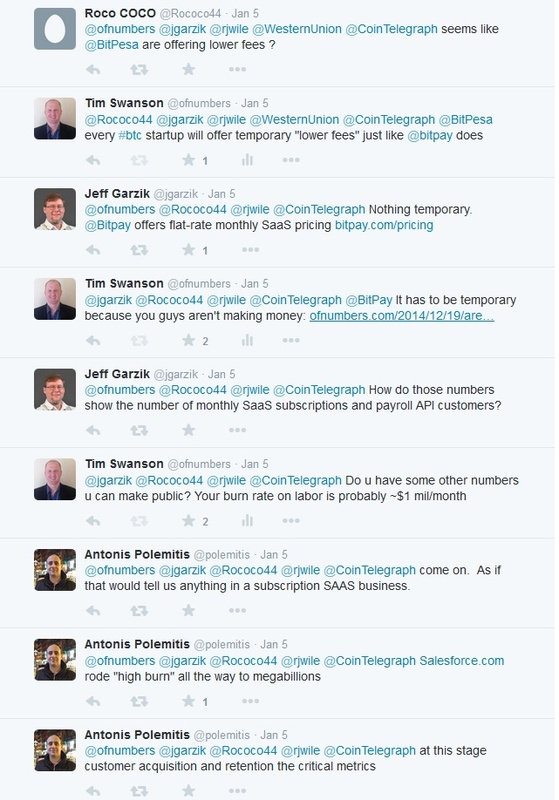 For the six months between September 18, 2014 – March 18, 2015 saw traction. 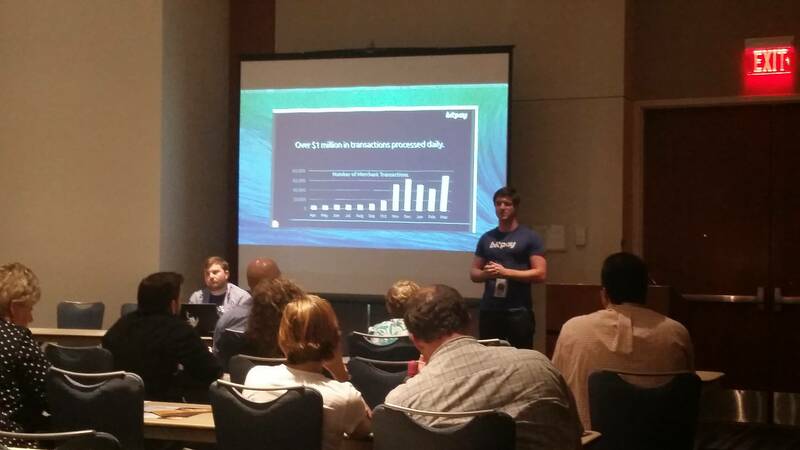 During this time frame they processed 2,025 transactions and 1,260 bitcoins per day. 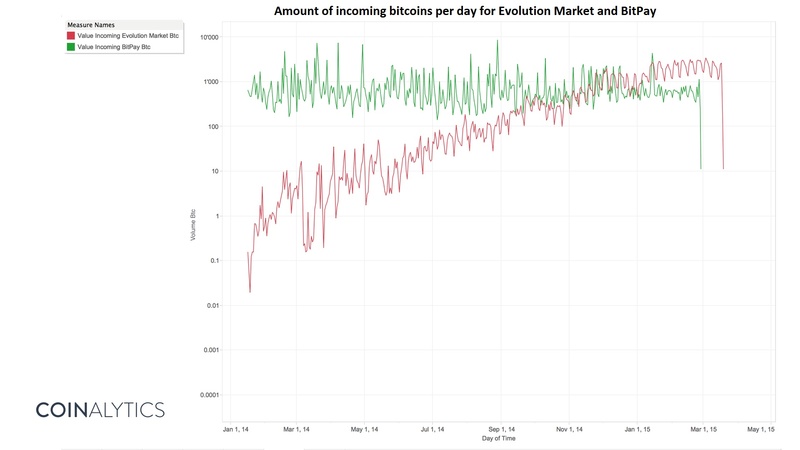 Another way of looking at that same trend is the comparison above: a log scale measuring the amount of bitcoins that both BitPay (in green) and Evolution (in red) received starting January 16, 2014. The drop off at the end in March 2015 is related to the exit scam that Evolution underwent (and the drop off for BitPay is related to a limitation in WalletExplorer’s data). 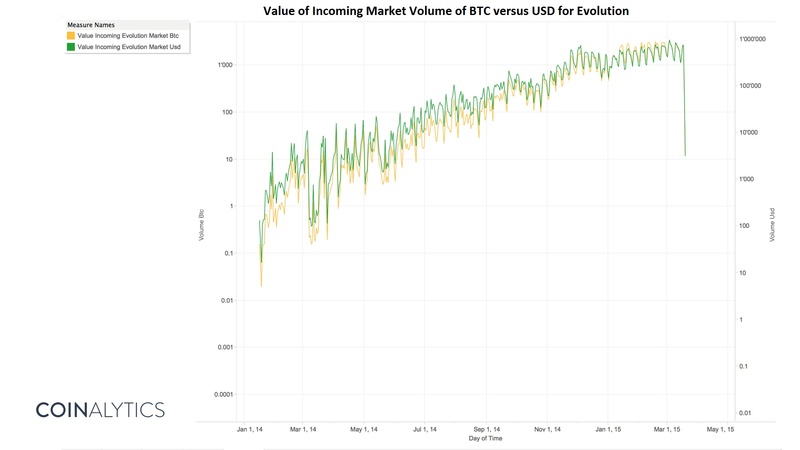 The log chart above measures the value of incoming market volume between BTC and USD. 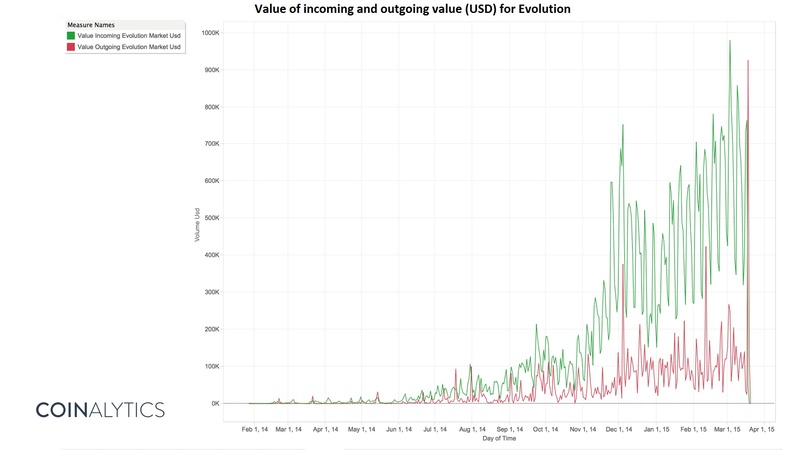 In terms of USD, the average value sent to Evolution between March 18 2014 – March 18 2015 was $190,179 per day. 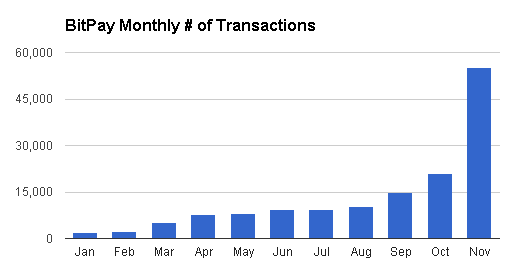 As it achieved traction, between September 18 2014 – March 18, 2015 the average value sent was $353,669 per day. 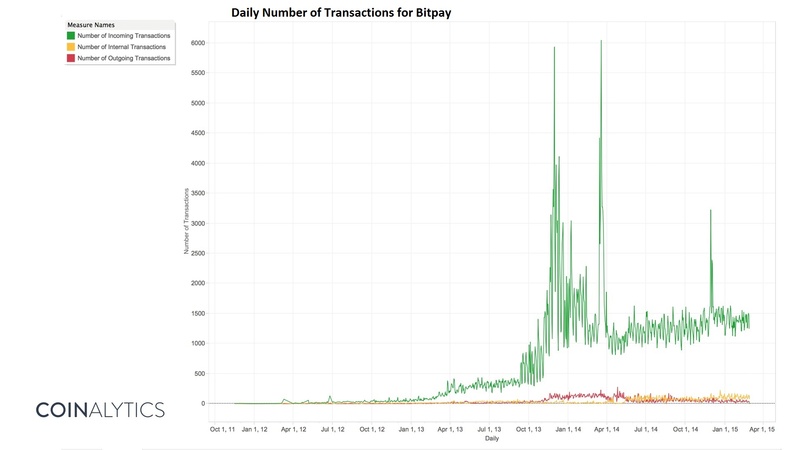 For comparison recall that based on the stats released last week by BitPay, on average BitPay processed 1,544 transactions worth $435,068 per day in 2014. The final chart above may be of interest to those wondering what the “exit scam” looked like in USD denominated value. The time frame above is between January 16, 2014 – March 18, 2015. As shown at the end, in March, the administrators “exited” with a large portion of coins valued at a range between $10-12 million USD (the full amount varies based on media outlet and is not fully captured in the chart above). Throughout this post the word “owner” has been used a few times. Why is this important when looking at economic activity and flows of funds? It seems like the preferred legal approach in many jurisdictions is that bitcoin is a form of digital property, and not money. This means that bitcoin would lack the negotiability of money. It is an important distinction in light of the concerns about the volume of fraud and theft. If the statistics are correct, a significant amount of people may not have good title to the bitcoin that they hold. Of course, this is all theoretical, as it is arguably nearly impossible to prove title to bitcoin and satisfy the nemo dat principle. However, you can’t merely ignore the issue. The law doesn’t cease to exist because you ignore it. For example, as Pamela Morgan points out, when you build a website, you get a default font without needing to specify any font. If you want to change the font, you need to write code to change it. The law has default positions that are implied into every situation. To change the default position, you have to actively create a new position that takes precedence over the default position. The default position for property (and bitcoin if it is deemed property) is that the nemo dat rule applies. Ignoring the problem doesn’t fix it. The only thing that can fix it is by creating a new default position – either by law (declaring bitcoin to have the same negotiability as fiat currency) or by private agreement. Nemo dat (short for nemo dat quod non habet) boils down to clean titles. If you buy property from someone who does not have ownership right of the property, then the new purchaser does not have a legitimate title to this property (e.g., you cannot sell what is not yours). Sexton is not the only practicing attorney with this view. Bitcoin is not currency in digital or virtual form. Rather, Bitcoin is virtually, or almost, currency. Why is this important? Currency can be thought of as property imbued, by the sovereign, with a special power. Specifically, the legal tender status of currency allows it to be transferred free and clear of, rather than subject to, all claims and defenses. In other words, currency is the only unconditional exception to nemo dat quod non habet, or the general rule that one can never transfer a better interest than one has. There are other conditional exceptions to nemo dat that apply to certain types of property (goods, negotiable instruments and security entitlements) if certain conditions are met (property is transferred “for value” and in “good faith”). If Bitcoin is not currency and does not fit within one of the statutory exceptions to nemo dat, nemo dat applies. At this point in the conversation, the issue of fungibility inevitably comes up. However, fungibility isn’t a solution; it is merely an evidentiary issue. This contrasts considerably with government cash. In the eyes of the UCC code, cash doesn’t take its claim history with it upon transfer. To the contrary, anyone who acquires cash starts off with a clean slate as far as previous claims are concerned. It is assumed, basically, that previous claims on cash are untraceable throughout the system. Though, liens it must be stressed can still be exercised over bank accounts or people. According to Fogg there is currently only one way to mitigate this sort of outstanding bitcoin claim risk in the eyes of US law. Rather than treating cryptocurrency as a general intangible, Fogg argues, investors could transform bitcoins into financial assets in line with Article 8 of the UCC. By doing this bitcoins would be absolved from their cumbersome claim history. Whether or not a court will agree with this view depends on the jurisdiction that future defendants/plaintiffs are located. US law seems pretty clear when it comes to property. And as it is encoded today, there is no technical means for the Bitcoin network to enforce off-chain asset rights based on terms-of-service (smart contract or otherwise); although there may be technical methods for integrating a terms-of-service into contracts transacted on the network. However that is a topic for a different post. Where the fiat leakage is occurring, where people take bitcoins out of circulation and purchase them with dollars or euros; how will this change in the coming months? Bitcoin and most other cryptocurrencies today, were intentionally designed not to interface with the current financial infrastructure. Satoshi Nakamoto purposefully designed the network so that on-chain activity would route around trusted third parties and this came at a capital intensive cost (e.g., proof-of-work). The decentralized, pseudonymous nature of these networks are a dual-edged sword: it provides advantages that can and will be used by both good and bad actors alike. It will be interesting to look again at how this flow chart evolves over the coming years. Future researchers may also be interested in breaking down the energy costs for maintaining each segment or bucket in the flows above. Furthermore, it has likely declined since their study because, as previously explored in Appendix B, this scales in proportion with the value of the token which has declined over the past year. If this is the case, is there a way to determine how much energy is being consumed to transfer and secure: the KYC activities as well as the non-KYC’ed activities? One constraint to consider too for this research is that if it somehow becomes cheaper to secure the network, it is also cheaper to attack the network — and this can impact both currency and non-currency applications of the network. I have spent the past month compiling research that took place between August and the present day. This was much more of a collaborative process than my previous publications as I had to talk with not just 8 geographically dispersed teams to find out what their approach was in this nascent field but also find out who is working on ideas that are closely related to these projects (as seen in Appendix A). Fortunately I had the help of not just astute practitioners in the industry who did the intellectual heavy lifting, but the resources and experience of the R3 CEV team where I am an advisor. I think the weakest part is in the beginning of Section 8 regarding TCP/IP. 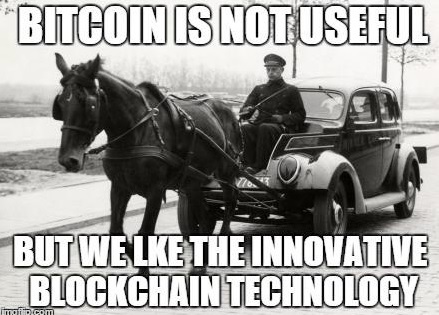 That is reflective of the fact that there is no perfect analogy because Bitcoin was designed to do many things that no other system does right now so there probably is no single apple’s to apple’s comparison. While you do not need special internetcoins or fun buxx to use the internet (as it were), there is still a cost to someone to connect to the net. So perhaps, the frictional differences between obtaining and securing an internet connection versus obtaining and securing a bitcoin at this time is probably something that should be highlighted more if the report is updated. For cryptocurrencies such as Bitcoin to do what it does best on its own terms, its competitive advantage lays with the native token and not representing real-world assets: its community needs to come to terms about what it is and is not good for. Because of its inability to control off-chain assets its developers should stop promising that bitcoins — or metacoins and watermarked-coins that use Bitcoin as a transportation layer — as a panacea for managing off-chain assets, assets the network cannot control. At most Bitcoin’s code base and node network operates as its own legal system for non-watermarked bitcoins. Consequently, the advantage a cryptocurrency system has is endogenous enforcement of contractual terms — or as Taulant Ramabaja calls it: “fully blockchain endogenous state transition without any external dependencies.” Or on-chain, dry code to dry code. I wonder if someone in the future will call themselves a full “dry code” stack developer?